UPDATE! TUC 2018 - list of competitors for Trout Tournament!. Fishing tackle retail and wholesale in Europe (EU) - Angler's Zone. 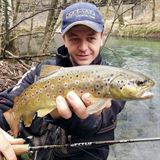 Now registrations for Trout Union Cup 2018 Bulgaria are completed. Totally at this event will fight 14 teams, 56 competitors from 8 countries. We proudly hope this Cup will be interesting for all of us: competitors, fishermen and fans!